Backpacking has gotten more and more popular as a form of traveling, and for obvious reasons: for people going to multiple destinations, carrying gear on your back helps keep you mobile while having everything you need at arm’s length. 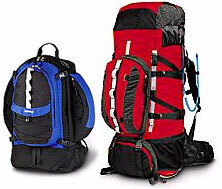 But as more “nomadic” travelers are heading out in the world, the packs they carry seem to get bigger and bigger. It’s not uncommon, these days, to see people carrying backpacks that look more like skyscrapers towering over their heads, or backpackers looking as though they might collapse under the weight of their bag. Traveling light is one of the greatest advantages of backpacking, and packing wisely can help make your trip much more enjoyable.Over the last 10 years I have traveled throughout Europe, the Caribbean, and elsewhere, never taking more than a 2500-cubic-inch backpack with me. This small size can be tough if you’re going out for an extended period (more than a few weeks) or are traveling to both hot and cold climates. But even if that’s the case, you shouldn’t need a bulky 5000-cubic-inch pack or more, which–fully loaded–makes falling over easier than standing up. Simply finding a place to store your pack for the day is much easier when you’re not toting all that weight. Ever try fitting a big internal-frame pack into a locker at a train station? It’s nearly impossible. And walking around a city for a day while shouldering that burden is not fun. Below is a list of items that can fit easily into a small pack, with room to spare. Of course, the things on this list will vary depending on your destination, bur the idea remains true. Use this as a starting point. All of this and more will fit nicely in a 2500-cubic-inch backpack. And if your pack is a little bigger you’ll have plenty of extra space for whatever else you might want to take. But anything over 3500 cubic inches is most likely overkill–you probably won’t end up needing that much room. Bringing a lot of extra clothes is an easy trap to fall into, but most places will give you the option of cleaning a shirt or two (in the sink, shower, or wherever) and hanging them to dry in a pinch. That said, it’s a good idea to bring a small plastic container of biodegradable liquid laundry detergent. Don’t leave home with your backpack stuffed to capacity, as that will probably be your best packing job throughout the whole trip. Somehow, repacking properly gets harder and harder as you go, so if you have a small backpack that is stuffed to the gills, then you should certainly upgrade to one a just little bigger. Using bungy cords to strap extra footwear or wet clothes to the outside makes drying and packing a lot easier. (Carabiners can be used for the same purpose.) Chances are, most people will not want to steal your smelly shoes, and bungy cords are important for keeping loose items from flopping around and becoming a nuisance. It’s understandable that many people would want to bring more gear than what I’ve suggested–after all, you can never be sure of everything you might need along the way–so if you plan on going for an extended period (several months), taking that big pack seems sensible. Who wants to wear the same clothes for 6 months, after all? But as with everything, you should be prepared to make certain sacrifices. Getting rid of some of the more extraneous gear will make touring a lot easier on your shoulders and back, which in turn, will make it easier on your state of mind. Remember most big packs (4000 cubic inches or more) were designed for long-term expeditions in remote areas, where you need this added space for a sleeping bag, camp stove, food, and other basic survival gear. For most backpackers, these days, surviving means little more than finding the nearest hostel and hoping it has a bar. It’s amazing how much simpler, and more enjoyable, traveling can be when you pack light and leave the kitchen sink at home.